Eric Smith has joined the Youngstown State baseball program as an assistant coach and recruiting coordinator, head coach Dan Bertolini announced on Friday. Smith was the volunteer assistant coach at Eastern Kentucky in 2016, and he has five additional years of experience coaching at the Division I level. "Eric's energy and passion for the game made it an easy fit for our program," Bertolini said. "He will work primarily with our outfielders and catchers and assist in hitting. We are very excited to have Eric on our staff." With Smith on the staff last year, Eastern Kentucky hit 66 home runs and batted .290 as a team. Mandy Alvarez led the nation in hits per game and was named the Co-Ohio Valley Conference Player of the Year. Kyle Nowlin, a First-Team All-OVC selection, tied for second among the country's leaders with 21 home runs. 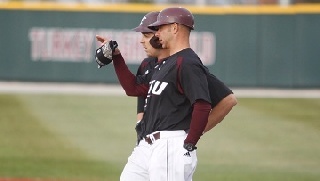 In addition to working with EKU's hitters, Smith directed the Colonels' camps and helped with the outfielders. Smith spent the 2013-15 seasons as an assistant coach at Division II Philadelphia University as the program's recruiting coordinator and assistant coach. During his second season, the Rams reached the playoffs for the first time in six years. In 2011 and 2012, Smith was an assistant coach and camp director at La Salle. The Explorers were the Big 5 Team of the Year in 2011 with a 28-26 record. Smith got his start in coaching at his alma mater, Mount St. Mary's, during the 2008-10 seasons. He served as an assistant coach and recruiting coordinator for the Mountaineers and helped the 2008 squad make the NCAA Tournament for the first time in program history. Mount St. Mary's was also strong academically with Smith on the staff, ranking in the top 10 percent in the country in team GPA. Smith was one of Mount St. Mary's all-time best hitters. He ended his career as the all-time leader in hits (198), runs (127), RBIs (139) and total bases (304), and he still holds the career record for times being hit by a pitch (33). A three-time second-team All-NEC selection, he batted .341 over his four-year career. Smith graduated from Mount St. Mary's in 2007 with a bachelor's degree in business.